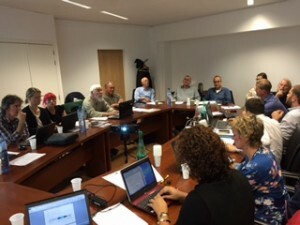 After the SMILEGOV final conference that took place 24 June 2015 in Brussels, the SMILEGOV cluster leaders gathered for the last coordination project meeting on 15-16 September, marking the end of an intense 30 months project. SMILEGOV represented a unique opportunity to gather 12 islands clusters from the EU and beyond. It enhanced cooperation between a large range of stakeholders involved in the implementation of Islands sustainable energy action plans. It created a path between remoted, non-experimented islands to facilitate notably through capacity building activities, the achievement of the EU 20-20-20 objectives. Partners, cluster participants, learnt from each other; they gained new tools and experiences to overcome multilevel governance barriers that can prevent the success of their island sustainable energy strategies. Moreover, the SMILEGOV project welcomed 41 more islands in the Pact of islands signatories’ family; more are on the way, soon overtaking 120 members. New tools and results are now available on the SMILEGOV website, and the free e-learning platform Energy Academy 2020 is still open to provide on-line courses and more knowledge to anyone involved in energy planning and strategy. SMILEGOV is not just about sharing knowledge; it is a process and the beginning of a long and successful islands cooperation, paving the way to sustainability in the EU.